This is one of the sample cards which I took to Birmingham with me and I thought I'd share it with you here. I made it to showcase the Tonic Studios Celtic Border punch and matching Celtic Strip punch. The border stays attached to the paper while the strip is just that....a strip! I love the way this design can be embellished by threading narrow ribbon through the centre. 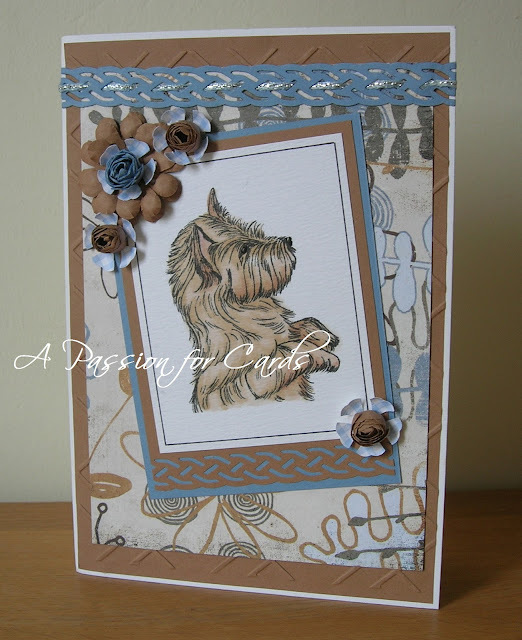 The image is one of my own - Cairn Terrier available from A Passion for Stamps and I've coloured it with Promarkers. The flowers were made using the Tonic Studios Petal Pairs Petites rolled to create roses and the large one is using the Multi Detail Flower. I've used Glossy Accents to highlight the nose and eye but it's not showing up too well in the photo.